The cold, dry winter climate presents a health challenge for many people. It is a time when young children, babies, and the elderly are especially vulnerable to catching a cold. It’s a no-brainer to dress warmly when it’s cold, but as winter transitions to spring, dressing warmly is also important. During this time, the temperature may fluctuate dramatically. What starts as a warm, sunny day can end cold and blustery, or vice versa. Most colds involve the Lung. One of the Lung’s functions is to send protective Qi to the space between the skin and muscles. This energy defense, or Wei Qi, warms the skin and muscles and protects the body from pathogens, such as cold and wind. Keeping the Lung’s energy strong helps the body to resist illness, particularly in the winter. When you dress warmly, the Lung doesn’t have to work overtime and can conserve its energy. When cold breaks through this protective energy barrier, it can travel to the Lung. Cold can also enter the Lung through the nose. As your only internal organ in direct contact with the outside world, the Lung is vulnerable and difficult to treat when it encounters a problem. Traditionally, if a child with a lingering cough is still being breast fed, the mother is given herbs to treat the condition. The essence of the herbs is transferred to the baby through the mother’s milk. Likewise, a nursing mom with a child who has a cold can drink ginger tea. 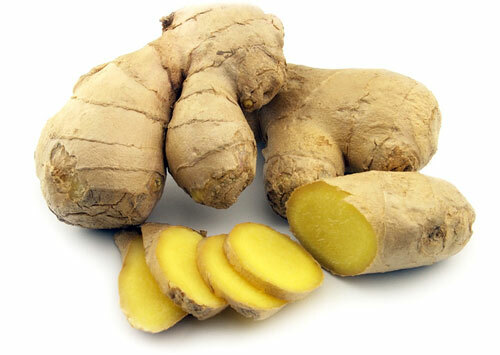 Ginger’s warm and soothing essence is effective for relieving cold symptoms. When ginger is applied to the skin, it can relieve symptoms of internal cold. A child’s energy is pure and strong. Health problems usually remain on the surface and do not go to a deeper level. If your child has been treated for a cold or bronchitis and has a lingering cough, try this ginger massage to help your child recall his or her self-healing ability. Extract the juice from a fresh gingerroot using a garlic press. Then use the liquid to massage the body. Remember that a child’s skin is delicate. Use a light touch and spend only two or three minutes on each of the following areas. The older the child, the longer you can massage each area.